It’s hot out. Time to relax. Go ahead, crack open a brew. How does a cold craft beer sound? Maybe a Percheron IPA from Ploughshare Brewing in Lincoln, Prairie Fire from Scratchtown Brewing in Ord, or Jug Thumper from Lucky Bucket Brewing in La Vista. How about popping the cap off one of Blue Blood Brewing’s 543 Skull Creek Pale Ale? Pour it in a glass. Can you smell that spicy citrus with hints of orange peel and pineapple? That smell’s there thanks to fresh whole leaf hops picked from a couple acres tended by Bill and Shad Rhynalds near Prague. Nebraska is in the midst of a frothy renaissance and now boasts more than 25 craft breweries all in need of ingredients to brew their barley pop. That need is driving an emergence of a new commercial crop in the state — hops. “People buy our beer because we’re local. … This whole game is about being local,” said Brian Podwinski, the founder and head brewer of Blue Blood in Lincoln. And buying local means discerning brewers can visit the field, chat with the farmer and watch the hops, which look like small green pine cones, develop on the bine (That’s not a typo. Hops grow on a bine, not a vine). In a sign of the growing demand, the Nebraska Hop Growers Association within five years has grown from its founding by three families to about 50 members, said Stephen Bowman, vice president of the organization. Nebraska next year will see its first Grower and Brewer Conference and Trade Show Jan. 5-6 at UNL’s Innovation Campus (growbrewnebraska.com). Blue Blood has a handshake deal with the Rhynalds to buy the entire harvest off their two acres for making the Skull Creek Pale ale. It’s enough hops to brew about 1,500 gallons of beer. Podwinski adds whole cones to the boiling wort, which is what you call beer before mixing in the yeast that eats the sugars converting them to alcohol. Once the Skull Creek Pale is gone, it’s gone, at least until after next harvest. That seasonal availability is part of difficulty with sourcing hops locally, but that is changing. Midwest Hop Producers, a business started two years ago by Bruce and Annette Wiles, is working to develop a regional distribution hub offering to process hops for farmers and connect them with brewers looking to buy. The husband-and-wife duo began looking to grow hops as a way to supplement and diversify their farm. “And honestly, hops post-production is a lot more fun than corn and beans,” Annette Wiles said. When the Wiles started, they found plenty of demand for their hops, but little in the way of infrastructure to get them processed and to market. It’s a niche they’re now working to fill. They’re working to develop and build a hop processing facility, including dryers, storage and machines that will grind and turn the hops into pellets that resemble rabbit food. Brewers generally use the pelleted hops for the majority of their beer and only work with the full cone for specialty or seasonal brews. The Wiles envision Midwest Hop Producers becoming a regional broker, buying, selling, marketing and producing hops, as well as offering processing services to farmers, Annette Wiles said. They’ve also reached out to the University of Nebraska-Lincoln, where several researchers are working on different aspects of the hops crop, including cultivation, genetic and disease research, and engineering processing equipment. UNL horticulture professor Stacy Adams isn’t a beer drinker. “I’ll drink it to taste it because I think it’s fascinating to get all the flavors. But beer is an acquired taste, and I just never totally acquired it,” he said during a recent interview while standing under 17-foot trellises covered in the long creeping hop bines growing in an UNL East Campus garden. But he is a plant geek, and hops fascinate him. 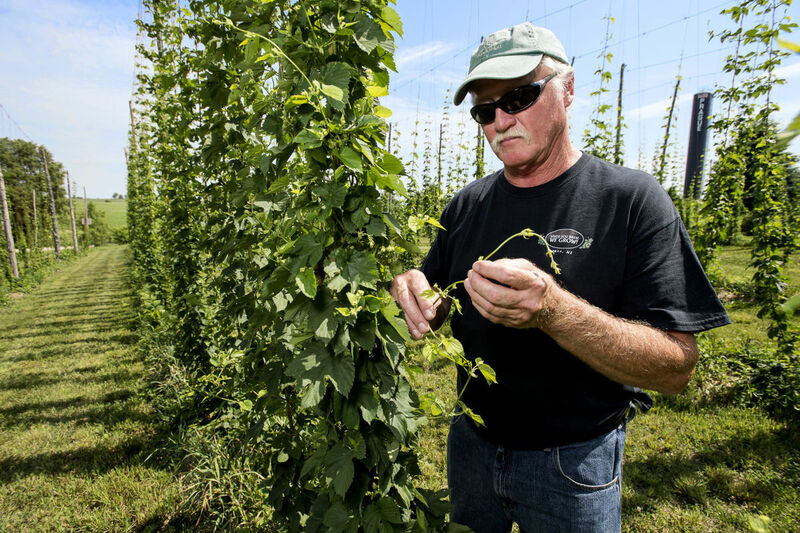 He sees a lot of potential for Nebraska in the hop plant thanks to demand from brewers, as well as its uses in both medicinal applications and in the floral industry. “Consumers today … they want to know who the grower is. And they like unique. They like flavors. They’re taking selfies with their food and they like social activities,” he said. Hops, he said, fits that lifestyle and gives farmers struggling with low corn prices an alternative crop to branch out into. Hops growers nationwide are struggling to keep up with demand. Adams said estimates show America’s growers will need to plant an additional 11,000 to 11,500 acres of hops by 2020 to keep up with the blooming microbrew industry. The Pacific Northwest dominates the nation’s hops supply, an area with vastly different growing conditions and soil compared to Nebraska. Nebraska will have to prove it can grow quality hops consistently to compete with the nation’s top growing states — 98 percent of American hops are grown in Oregon, Washington, Idaho and Michigan, Adams said. That’s where UNL comes in. Adams is leading a project to test how hops grow throughout the state and evaluate best practices for a bumper harvest. With the help of a few Nebraska farmers, UNL has established five plots in or near Lincoln, Valparaiso, Norfolk, Sutton and Scottsbluff. They’re growing just a handful of the 80 varieties of hops in commercial use today, including Centennial, Chinook, Crystal, Pearl, Willamette, Columbia, Cluster and Zeus. Hops have long graced the gardens of Nebraska hobby brewers. Settlers brought it with them to the state, planting where they settled, often along stream beds and railroad lines. The legacy of those early brewers can still be found growing wild around old homesteads. One of UNL’s projects includes finding those plants, mapping their genetic legacy and incorporating the traits that let them thrive here into modern stock. “If the plant has survived 150 or 160 years in Nebraska, it must have qualities suitable for our environment,” Adams said. A hop plant can produce for decades. It grows rapidly, climbing trellises until the summer solstice when days begin to shorten again. That signals the plant to begin putting out axillaries called ladders and start flowering. At harvest time, the bines are cut a couple feet from the ground. The cones are stripped off then dried. The root, called a rhizome, overwinters underground and sprouts again in the spring. Just like grapes, hops develop chemistry and characteristics unique to where and how they’re grown. Adams said Nebraska hops could eventually be sought after because of the tones the state’s clay heavy soil and windy conditions create. You can smell it and taste it yourself. Just crack open a brew.